These are by far my most popular cookies. They are crispy on the outside and soft and chewy in the centre. 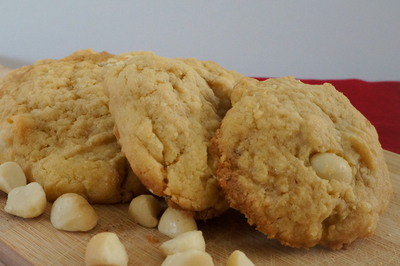 The combination of white chocolate and macadamia is a match made in heaven! 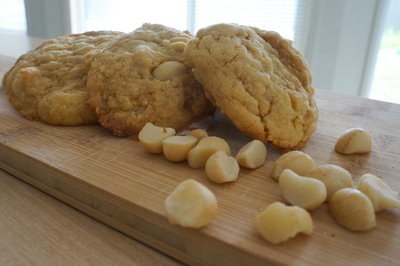 This recipe makes about 24 small biscuits or 12 large, thinner cookies (my favourite). Preheat oven to 180 C and line three baking trays with baking paper. Beat butter, sugars and vanilla extract until light and fluffy. Add eggs one at a time, beating well after each addition. Sift flour and baking powder over mixture. Mix together until combined. Add chocolate and nuts. Combine. Spoon tablespoon sized balls on to tray. Flatten with fork if you want a thinner biscuit. Bake for 15 minutes or until lightly golden. Leave to cool on tray for 5 minutes before moving to wire rack to cool completely. These cookies will spread so space out on the trays.